Blogger is a very popular free blogging platform, but it’s very limited in it’s template system, still with a little thought it’s possible to add AdSense and SEO optimization to most BlogSpot templates, and below you’ll find the ones I’ve converted so far. I used to sell the Blogger templates below, but I’m giving them away for free now, enjoy. 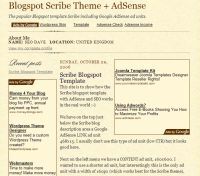 Please note these AdSense blogger templates only work on the old Classic Template system, they are not XML compatible. you know its not right to ask for a payment for a template. SHAME ON YOU!!!!!! LOL Jason, so you think everything online should be free? Thanks a lot for sharing these wonderful blogger templates! 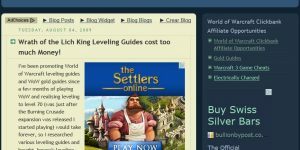 I am planning to create a Amazon Affiliate site. Will this improve in Search? I like the idea of an adsense ready template for blogger. But do you have some converted wordpress templates? I like some business wordpress themes but its easier for me to work on blogger. So I’d appreciate it if you can show me some converted BlogSpot templates. Malicious code and riddled with your Adsense. WANKER! Despite the retarded nature of your comment I’ve approved it. You would know how to install them. Classic Blogger templates (using the classic template system) are basically HTML files with some Blogger specific tags, not the newer XML based templates. 2. 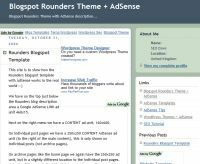 It’s not riddled with my AdSense code, the way Blogger works it’s the only way to add AdSense to a template (last time I checked the newer template system uses custom widgets). Had you read the instructions near the top of each template file (and where you downloaded the template) you’d know this. Search and replace all 6 instances of pub-8325072546567078 with your Google AdSense publisher ID.